In general the first determination is your actual job responsibilities. If you work in a non-supervisor role, then typically the OSHA 10 Hour Course is best for you. If, however, you have line management, resource management, safety director responsibilities or executive level supervision, the OSHA 30 Hour Course will be for you. The OSHA 10 Hour courses will provide this material in an overview fashion and typically conclude in less than 2 days. The OSHA 30 Hour Courses, however, expand this material and add a few other topics as well. That course typically will need around four days to complete. Each course is offered with either a Construction Industry Focus or a General Industry approach depending on the student’s line of work. All four courses can be taken either on-site at your company’s location or on-line through our computer based video series. 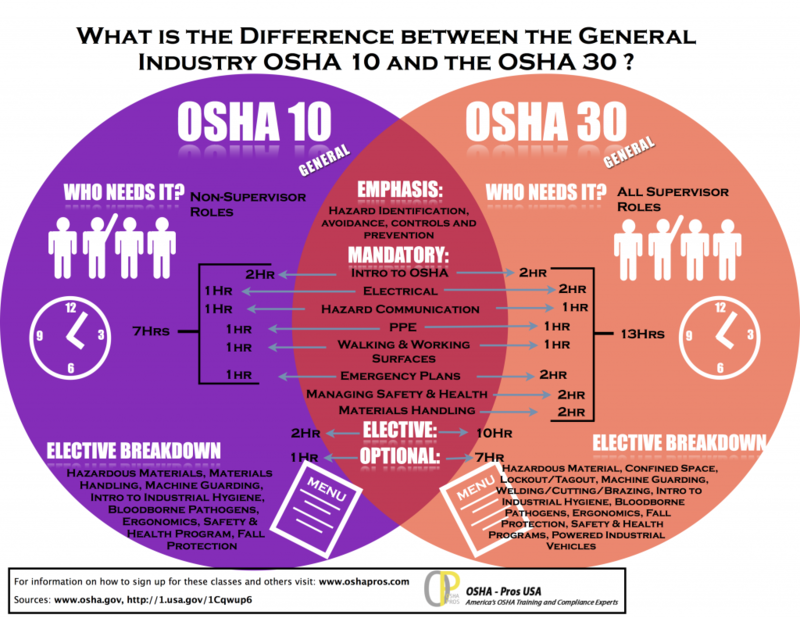 Take a look at our Infographic below to get a better idea of what’s covered, then use it to select the OSHA safety training that’s right for you.